This article is about the Interstate highway in Colorado and Nebraska. For the Interstate highway in Ohio, Pennsylvania, and New Jersey, see Interstate 76 (Ohio–New Jersey). For the 1997 video game, see Interstate '76. Interstate 76 (I-76) is an Interstate Highway that runs from Interstate 70 in Arvada, Colorado (near Denver) to an intersection with Interstate 80 near Big Springs, Nebraska. All but 3 miles of the road's route is in Colorado. Interstate 76 begins at an interchange with I-70 in Arvada. From I-70, the freeway heads east to an exit at SH 95, known as Sheridan Boulevard. The route heads northeastward across US 287, known as Federal Boulevard, to an interchange with I-25. Running roughly parallel to the nearby Clear Creek, I-76 meets another interchange, with Interstate 270 in North Washington, Colorado, where the Clear Creek joins the South Platte River, which is crossed by I-76. After an interchange at SH 224, I-76 joins US 85 and US 6 at Brighton Boulevard. Past Derby, US 85 veers away from I-76 at Dayton Way. The combined routes of US 6 and I-76 head northeastward, crossing SH 2, named Sable Boulevard, before meeting an exit at E-470, a toll road. Past E-470, the freeway exits the Denver-Aurora metropolitan area. Passing just west of Barr Lake, the freeway heads northeastward east of Brighton. Near Lochbuie, the freeway crosses SH 7 before crossing into Weld County. I-76 meets SH 52 in Hudson, the next city along the freeway. Past Hudson, the combined routes of US 6 and I-76 turn slightly eastward into Keenesburg, which is served by a business loop (I-76 BUS). I-76 then turns northeast and east into Roggen, where it meets County Road 73. The highway heads away from the farmland it was formerly running through and traverses a large grassland area. Just south of the Empire Reservoir, the freeway turns back east, crossing into Morgan County within circular fields. Heading east, I-76 heads into Wiggins, near which I-76 joins US 34. The three combined routes head east through farms. The freeway heads east toward Fort Morgan, spawning another business loop that carries US 34 away from I-76. The freeway heads east into Fort Morgan, meeting SH 52, now running again near the South Platte River. Still running between the South Platte River to the north and its business loop to the south, I-76 heads just north of Brush, where it meets a cloverleaf interchange with SH 71. US 34 veers away from the business loop as I-76 turns back east, crossing over the business loop, which does not terminate at the freeway. I-76 BUS carries US 6 toward Hillrose. Bypassing that city, I-76 traverses northeast into Washington County, with farms to the north along the river and grasslands to the south. Passing the Prewitt Reservoir, the freeway heads into Logan County. Heading northeasterly, the route crosses SH 63, which serves Atwood. I-76 BUS then enters Sterling, which is near I-76. The business loops turns abruptly east within the city, carrying US 6. US 6 continues past the interchange with the business route. In Nebraska, I-76 stretches just over three miles (5 km). It is signed as a north–south direction as opposed to the east–west designation in Colorado. Its entire route is located in Deuel County, parallel to the South Platte River and U.S. Highway 138. Its only interchange is at Interstate 80, numbered exit 102 based on I-80's mileage. Until 1975, both the western segment of Interstate 76 and a portion of the eastern Interstate 76 were signed as Interstate 80S. In July 1976, the already-completed route, I-80S, was renumbered to I-76 in accordance with American Association of State Highway and Transportation Officials (AASHTO) policy to remove the letter suffixes from Interstate routes and to avoid the confusion of this route with Interstate 80. This prompted the replacement of around 500 signs in eliminating I-80S. The number, "76", has an association with 1876, the year Colorado was admitted as a state. ^ a b c d e Colorado Department of Transportation. "The History of I-76 in Colorado". Colorado Department of Transportation. ^ a b "Nebraska Highway Reference Log Book" (PDF). Nebraska Department of Roads. 2015. p. 190. Retrieved January 8, 2017. ^ Microsoft; Nokia (March 3, 2011). "I-76 in Colorado" (Map). Bing Maps. Microsoft. Retrieved March 3, 2011. 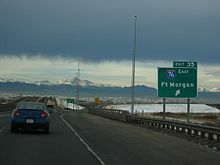 Wikimedia Commons has media related to Interstate 76 (Colorado–Nebraska).